Winston-Salem Periodontics is known for using a unique approach in treating each patient with individual care and modern dental procedures leading to long-lasting solutions for patients. 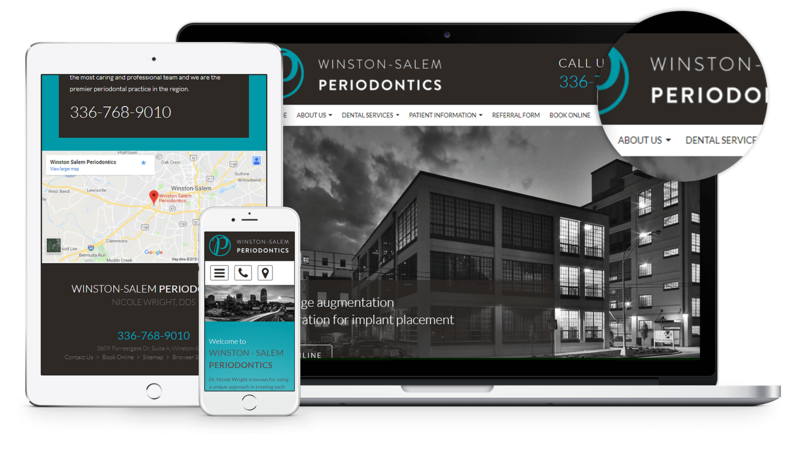 We are pleased to announce the brand new website for Winston-Salem Periodontics ! Winston-Salem Periodontics is known for using a unique approach in treating each patient with individual care and modern dental procedures leading to long-lasting solutions for patients. Their dynamic team will strive to ensure you are comfortable and confident with the complete oral health care you are receiving and will continue to receive. The website is an absolutely fun and attractive layout with very beautiful colours and attractive design. It is very user-friendly platform based website that can be accessed on your smartphone, tablet or computer. Patients can book their appointment through the actual website, they can educate themselves on terms and procedures, they can get directions directly through the website to know the route to take towards the practice and you can read on Winston-Salem Periodontics`s services from the website itself as well. Patients can also fill out the Paperless Referral Form from the comfort of their own tablet or smartphone. Overall this website is very well put together and very pleasing on the eye.